AP #Memo No.26223-A/160/TFR/2015Fin Dt 17-7-2015, PRC Pay fixation Bills submit Govt have isued instruction to DTA Admmit PRC Bills as spl bills With out time limit.www.aptreasury.gov.in. The pay fixation of the state Government employees in the Revised Pay Scales 2015 in pursuance of the orders in the references 2nd to 4th read above are in progress. Many employees Associations are requesting to expedite fixation of pay in revised scales and payment of salaries in the Revised Pay Scales at the earliest. 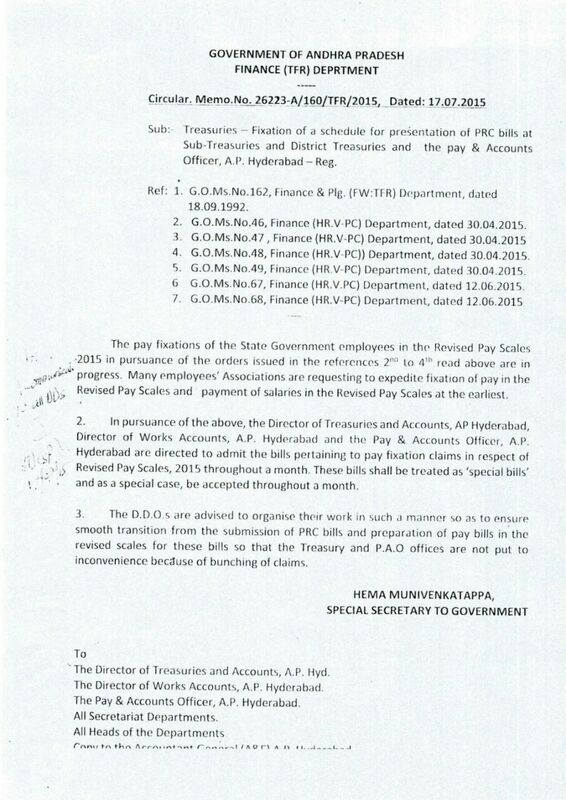 In pursuance of the above, the Director of Treasuries and Accounts, AP Hyderabad Director of Works Accounts, AP, Hyderabad and the Pay and Accounts Officer of AP Hyderabad are directed to admit bills pertaining to pay fixation claims in respect of Revised Pay Scales 2015 throughout a month. These bills shall be treated as special bills and as a special case be accepted throughout a month.